Aura Vision, a Z21 Innovation project, outshone thousands of candidates to join the latest cohort of the world-famous accelerator, which has launched countless global brands including Airbnb, Dropbox and Reddit. They become part of Y Combinator’s winter 2019 cohort, taking their place among an impressive line of outstanding startup successes. To date, the accelerator has helped launch 93 companies that are now valued at over $100 billion, directly leading to the creation of over 28,000 jobs worldwide. Aura Vision has built upon cutting-edge postgraduate research at Southampton to produce a visitor analytics platform for retail stores that measures and improves shopping experiences producing valuable insights into customer behaviour to help boost sales and marketing performance. Developed by machine learning experts at Southampton, the deep learning technology uses CCTV cameras to capture shopper information, without accessing sensitive personal information. The data helps retailers understand how shoppers move around and experience their stores. 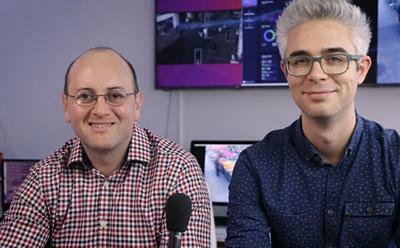 The startup was co-founded by Daniel Martinho-Corbishley and Jaime Lomeli during their PhDs in Southampton’s School of Electronics and Computer Science.